Just look at that proud little face. Even if we aren’t expecting them, it doesn’t keep us from getting super excited and celebrating Noah’s accomplishments. How To Help Your Child Learn To Stand Up / Pull Their Self Up. There are several tools that need to come together for a child to stand. Noah is pulling up from a kneeling position, which we have been working on at physical therapy.Kneeling helps strengthen the legs to be ready for standing. There are several different activities to work on in kneeling, one that has helped with this milestone today is doing half kneeling, where one foot is placed flat on the floor with the other knee on the ground. Noah is pushing up from this position in the video. Check out those knees in action. Standing also involves something we are very familiar with which is the core. I am starting to notice a theme with all of our developmental milestones, that one must have a strong core to achieve them. Noah continues to work on his core muscles with each therapy session. Since we first brought Noah home from the hospital he’s had a very strong desire to have his back extended. Tummy time was awesome for him, and he was great at it. It’s one reason sitting was a difficult task for us to accomplish, as he didn’t like to flex. I am excited that he now gets to extend his back again during these activities. He will be one happy camper. When mastering pulling to stand the child will initially rely on upper body strength to get them up, and as they get stronger will transition to using the lower body, as well as being able to gain endurance so that they can stand longer. Our little man standing tall! This toy is a real winner! This toy is hard to find in stores, but you can purchase it on Amazon by clicking the link above, and I’ve also seen it several times at second-hand stores like Once Upon A Child which is where we scored this one. 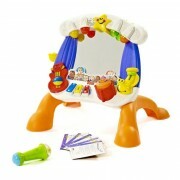 It has a firm base, lots of lights and music and Noah’s best friend in the mirror. It has been a great tool for us to use. Has your child shocked you by achieving a milestone you were not expecting? Any other working parents out there that experience milestones via video? Woohoo! Way to go, Noah! Thanks! 🙂 Are you guys doing anything fun on the 4th of July? Totally awesome! Go Noah! I think my little Otto man is going to crawl before he ever learns to sit up. He seems to have no desire to do it. But, alas, he will do it at his own speed. And before I know it, he’ll be chasing his sister around the house. Thank you for the encouragement! Hey Brandy, just wanted to check in and see how things are going with your little boy? What’s new in his world? Fantastic work Noah! I hear you on the core strength, loud and clear! Honestly anything cooper does kind of amazes me as they did not give him much survival hope after birth ( he has cp) but the big thing was eating and its something he just adores! Thanks for the comment. How is your son doing now? What’s he up to these days? Thanks! We’re pretty proud of him also! Do you have children as well? Little Man and I watched this video and Little Man kept clapping when he could hear daddy saying “yay, Noah” in the video. He really enjoys watching videos of other kids (and himself) so these are perfect for him. Would you mind sharing how often Noah goes to physio? Our little one is 9 months old and is adopted. She hasn’t started physio yet but they are telling us she will only get to go once a month. He will turn 3 years old in December and now he goes once a week to physical, occupational and speech therapy. However there was a time when he was going PT/OT 2-3 times a week! How is she developing and growing since you left this comment? I am SOOO going to miss watching him do the Inch Worm across our floor, but i LOVE this new milestone! Way to go NOAH!!! Thanks! Do you have any children of your own? Breanna, you have to push with how much you feel your child needs physical thep. My baby boy is almost 9 months and I had to push for him to get it once a week. I’m now going to work on getting it twice a week. You know your child and know what they need. Don’t let them decide for you. I found your blog through Twitter and I have to say that I think your whole family is amazing. You took what could potentially be a difficult diagnosis and turned it into something beautiful. Noah is a very lucky boy to have such wonderful parents. Thanks for the kind words! Parenting is a lot of fun, that’s for sure! Do you have a child with Down syndrome yourself? How is he doing when it comes to pulling to stand? 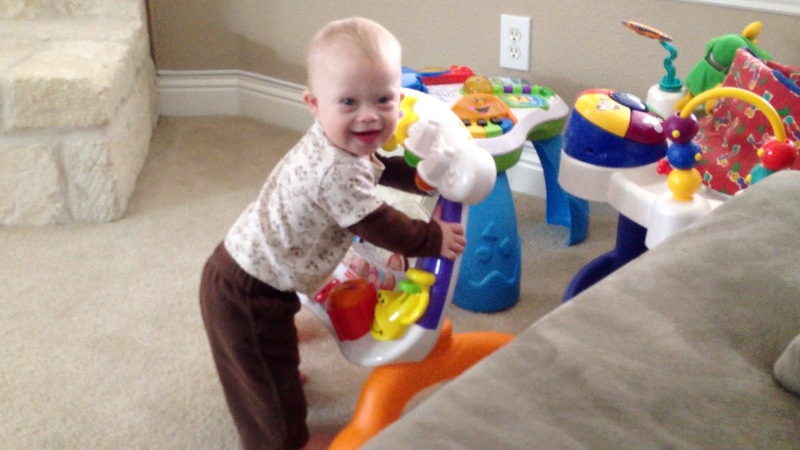 OMG I LOVE WATCHING YOUR SON…he reminds me so much of my son..the excitement on his face is priceless..My son is now 16months w DS and just started walking on his push toy..he gets that same look on his face.Thank you for sharing your son and his accomplishments with us…God Bless you. Thanks for the comment, and for the kind words! How is son doing these days? What sort of milestones is he working on / celebrating? Today my 13 month old shocked me with clapping, I really didn’t see that one coming, I am so proud of her. Very fun! 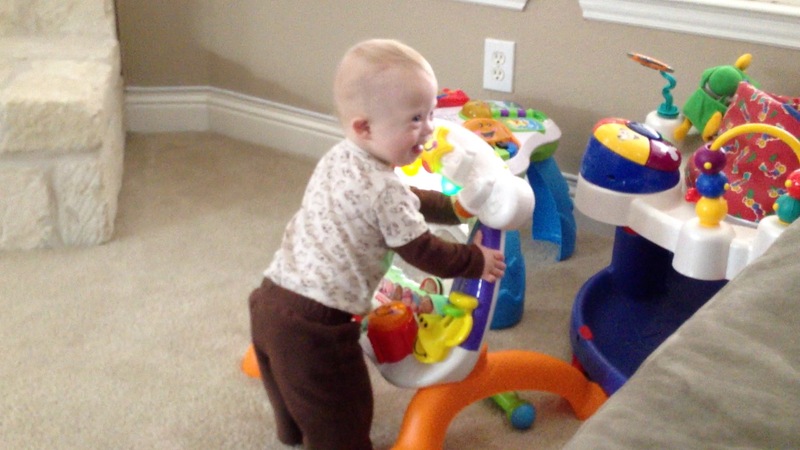 Does he have the same toy to help him pull to stand? Your web site is very interesting and would have very helpful when my daughter was Noah’s age. She is now a young adult so please remove my name from your e-mail list. Thank you. Thanks Nicole. Not sure what list you are referring to. Thanks for sharing! I would agree that moms make pretty good motivators, so way to go! 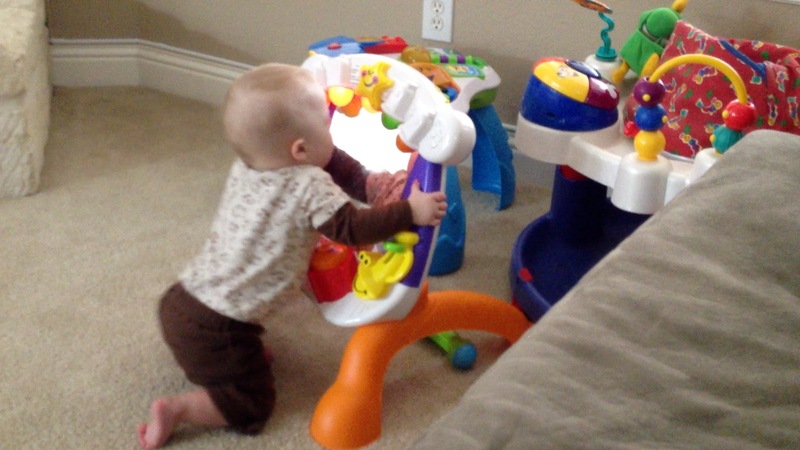 What current developmental milestones is he working on?